Mar 23 19:27: Magnitude recalculated from 6.1 to 6.0. Bogota / MMI V (Moderate shaking): I thought I was sick. Then I realized it was the earth moving. Centro de Armenia, Quindio (43.7 km ENE from epicenter) [Map] / MMI VII (Very strong shaking): The floor keeps moving after the earthquake pass in the center of Armenia, the ceilings and windows were shaking that everyone around me thought was going to collapse, people were crying abruptly and shaking but fortunately they were calm walking toward the main plaza to protect themself if any structure fall. It was longer.... we were really scare. Valle del cauca,tulua. / MMI VI (Strong shaking): I would like to inform that, the time of the earthquake is wrong.the time of the earthquake,was arround 1pm to 4pm. San Antonio de Pereira, Rionegro, Antioquia, Colom / MMI III (Weak shaking): Very light, slow, long shaking. Noticed water sloshing gently in water cooler. 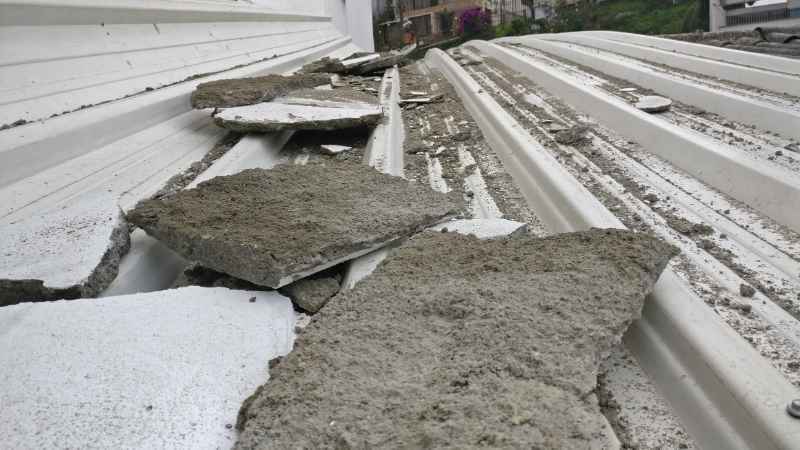 Manizales, Colombia / MMI V (Moderate shaking): Mother in law, daughter and I were having lunch and suddenly felt the whole house shaking. Furniture moved along the floor but pictures did not fall from the walls. It lasted for about a minute. Mom was terrified but daughter was calm just wondering what was going on. Nicaragua / MMI IV (Light shaking): It's around 3:20 a. m. When I still sleeping on bed. It shake like someone push the bed trying to awake you up. Lasted for about 5 to 10 seconds. Bogota / MMI V (Moderate shaking): I was watching tv and suddenly my bed was shaking, then I look at the door and it was shaking. The shake was light when it started but then became stronger, seconds later it became light again but lasted for about 2 -3 minutes. Medellin, poblado (213.8 km NNE from epicenter) [Map] / MMI V (Moderate shaking): I was listening to the tv and I heard the Windows rattling very good. I turned off the tv and looked out my 3rd floor window and felt and visually saw the building shaking while looking out. Cali / MMI III (Weak shaking): We felt the couch we were sitting on in a cafe in the San Antonio district shake. The chandelier started swinging slightly too. But it was so quick and light we weren't positive that it was an earthquake. (123.9 km SSW from epicenter) [Map] / MMI V (Moderate shaking): I sat on a bed and was home alone, thought someone was pushing the bed until I realised the walls and other furniture were shaking as well. Pereira / MMI IX (Violent shaking): I thought the five story building where I live was going to come down. Terrible feeling! (98.2 km NNE from epicenter) [Map] / MMI V (Moderate shaking): We were in Manizales in the cafe in cathedral (3rd floor). Suddenly you could feel chairs swinging as well as decorative trees they had there were moving. Some people started panicking, especially the ones who were high in the tower of the cathedral. Then we all left the cafe as they closed in case of another shake. One of my dogs who were with us was clearly shaken by the event. Girardota, Antioquia / MMI IV (Light shaking): Very light compared to the I felt in San Francisco in 1989. 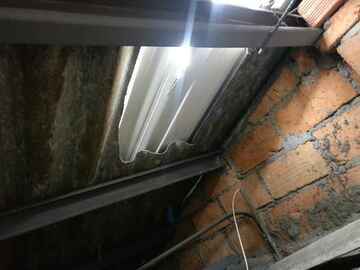 Manizales / MMI VI (Strong shaking): In the city of Manízales, we felt it, store merchandise was shaken off or the shelves, pictures off the wall, drips cieling tiles fell. Chinchina / MMI V (Moderate shaking): 30 sec the ground was shaking! (190.2 km NNE from epicenter) [Map] / MMI IX (Violent shaking): So bad I almost shat myself. My friend did. Tulua, Colombia / MMI V (Moderate shaking): The floor seemed to move about 3 inches in shaking. La virginia / MMI VI (Strong shaking): I'm pretty hungover so was just watching Netflix when all of a sudden my whole apartment shifted back and forth, 30 seconds im guessing. First earthquake I've experienced. Life is right back to normal, music playing people on the street. Armenia, Quindio / MMI V (Moderate shaking): Was taking a nap and woke up super fast. Strong shaking for a good amount of time. Everyone was outside. Cali / MMI IX (Violent shaking): Was in cosmo centric a large shopping centre in cali the whole building shook violently , what felt Like a minute , people were crying and screaming ! Chiclayo / MMI II (Very weak shaking): I sincerely hope thus does not delay my cocaine shipment. (112.5 km SSW from epicenter) [Map] / MMI V (Moderate shaking): Initialy, I was on my bed and felt the bed shake. Then, I went outside and the power lines were rocking back and forth. I have a stand fan and it shook around pretty violently. I almost thought it would tilt over. That's about it. Cali Colombia / MMI IV (Light shaking): Eating lunch in a cafe and the wall behind our table started shaking. People left the kitchen and walked to the restaurant door, people were walking out to the street from other buildings. It went on for a full minute or so. San Antonio neighborhood of Cali. Pereira, Colombia / MMI VI (Strong shaking): Shook like there was a giant jackhammer was being used. Have cracks in the wall from the shaking. It paused in the middle of the shaking..Think that's what spared more damage. Medellín / MMI IV (Light shaking): Bed moved back and forth like 20 times. Guadalajara de Buga / MMI III (Weak shaking): I felt a little shaking in my 2° floor while playing the piano, the room and entire house felt like moving and made sounds of the wood roof like it was gonna fall lol, most of the animals were scared but no accidents and was kinda simple, it was like 1 minute long. Rio Hato, Cocle, Panama (641.8 km NW from epicenter) [Map] / MMI IV (Light shaking): It was a long rolling feeling. Medellín / MMI V (Moderate shaking): It was very alarming and felt. Everyone is alright and all structures are intact. Praise God!! Medellin, Colombia. / MMI V (Moderate shaking): I live in a high rise, 18th floor. It was strong and lasted a long time. Two minor after shakes followed. It was moderate to strong. (222.4 km E from epicenter) [Map] / MMI IV (Light shaking): In the restaurant and the sensation was that something was wrong with me... but when I saw things moving I realize that was an earthquake... light, but significant.at all. Pereira (58 km NNE from epicenter) [Map] / MMI VI (Strong shaking): Lasted 45-60 seconds, much rumbling and shaking. Many people afraid and running onto streets. (296 km S from epicenter) [Map] / MMI VI (Strong shaking): We are in the mountains of la Buitrera de Palmira. We ran outside. Strong shaking. Nothing damaged. Cali Colombia / MMI V (Moderate shaking): Dogs barking, people running outside, portraits shaking. (217.9 km NNE from epicenter) [Map] / MMI III (Weak shaking): Heard dogs barking. Bookshelf started to sway.. Heard a very slight rumbling sound. I’m on the 14th floor of an apartment building. (98 km NNE from epicenter) [Map] / MMI VI (Strong shaking): The building I was in felt like it was swinging back and forth. I began to run downstairs and outside. (215 km E from epicenter) [Map] / MMI IV (Light shaking): My chair moved and I felt unbalanced. Curtains moved slightly. Pereira (59.6 km NNE from epicenter) [Map] / MMI III (Weak shaking): Light earhtquake, felt like a passing heavy truck. No damages. Cali / MMI V (Moderate shaking): shaking for about 5 seconds. pretty strong. Laureles-Estadio, Medellin / MMI III (Weak shaking): States with very light shaking, then intensified. Last about 60 seconds. Tulua / MMI VI (Strong shaking): Pretty awful. 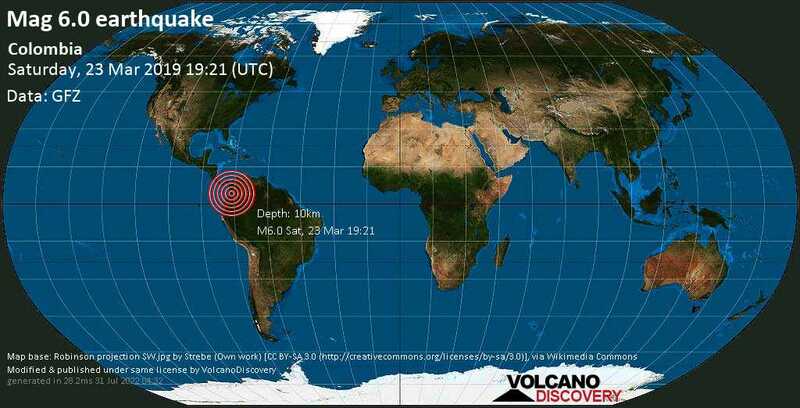 Cali, Colombia / MMI VI (Strong shaking): Sitting on my couch in cali, Colombia when I felt some shaking. I knew it was an earthquake and wasn’t very alarmed, but then the shaking got stronger and lasted longer than I expected. Some people in my apartment biilding we’re screaming and in a panic. I’m from California U.S. so I was a bit less alarmed. Jardin / MMI V (Moderate shaking): Light to strong for about 15 seconds. Started very light then strong tremors. Ran outside with wife and dog. (122.8 km SSW from epicenter) [Map] / MMI VI (Strong shaking): Everyone in my apartment complex went outside. No audible or visible damage. (104.8 km SW from epicenter) [Map] / MMI V (Moderate shaking): Felt the whole house shaking, windows and metal doors making noises. It lasted for like 6-8 seconds. Salento / MMI V (Moderate shaking): Felt the ground shake and tables shaking. Poblado, edificio ebano / MMI III (Weak shaking): Couch was swaying while I was sitting on it. Medellin / MMI III (Weak shaking): I was in the elevator. Shook strong 5 seconds or more.